How important are households’ expectations for spending? Phil Bunn, Lizzie Drapper, Alice Pugh and Jeremy Rowe. If the car you’re thinking of buying may be £500 cheaper in six months’ time, why not wait until then to buy it? This kind of thinking is one reason why falling prices trouble central bankers. The spectre of deflation is especially dangerous when households keep delaying their spending in expectation of further price falls. With the economy experiencing close to zero inflation, households may have adjusted their expectations of future prices. But how important are these expectations in influencing household spending? Using a rich household survey dataset we find that while there is some evidence that lower inflation expectations lead to lower spending, income expectations (reassuringly) also play an important role, and they have picked up recently. What can the NMG survey tell us about households’ expectations? As inflation has fallen to 0%, survey measures of households’ inflation expectations have also fallen, particularly at shorter horizons (Chart 1). These surveys of inflation expectations have been running for many years so we can judge how expectations have changed over time, but they don’t ask the same households about their spending, which makes it hard to assess the effect of inflation expectations on spending. The median household thought prices had risen by between 1 and 2% over the past year and expected a similar rise over the next year, although there were a range of views amongst households. The median expectation was for prices to be rising 2-3% a year in 2020 (Chart 2). The number of households reporting that they had increased spending over the past year was larger than the number who had reduced spending. This can be seen from the positive net percentage balance in Chart 3 (calculated as the percentage of respondents reporting an increase minus the percentage of respondents reporting a decrease, weighted where possible by the magnitude of the change). 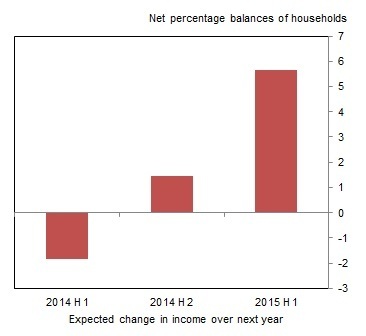 More households expected their income to rise than to fall over the next year (Chart 3). But the number of households expecting their overall financial situation to improve was only fractionally higher than the number expecting it to worsen. More households reported their overall financial situation had worsened over the last year than improved. How might households’ expectations affect their consumption decisions? Households’ income or financial expectations are likely to be important when they decide how much to spend. For example, in the standard life-cycle model, households who expect a lasting increase in their income should bring forward spending ahead of that increase actually happening. Some studies using microdata have found that expecting an improvement in household income and financial situation are associated with a greater readiness to spend (Bachmann, Berg and Sims (2015)). There is also some evidence to suggest that expectations about prospects for the wider economy can affect spending: for example higher expected unemployment tends to be associated with a lower readiness to spend (Hurd and Rohwedder (2013)). In other studies, these expectations have little effect over and above households’ current income (Carroll (1994)). Households who expect prices to rise more quickly are often thought to be more likely to raise spending now. If things will be more expensive tomorrow, why wouldn’t you buy them today and beat the price rise if you can afford to do so. More technically, one channel this works through is a lower real interest rate – the rate paid to borrow money minus the expected rate of inflation. The conventional Euler equation – which shows how a household’s wellbeing is maximised when it is indifferent between spending more today or tomorrow – relates consumption negatively to the real interest rate, since a higher real rate increases the real return to saving and the real cost of servicing nominal debt. Consistent with this, Burke and Ozdagli (2013) find that US consumers are more likely to buy a car as their short run inflation expectations rise. And D’Acunto, Hoang and Weber (2015) find that households in Germany that expect an increase in inflation are more likely to have a positive spending attitude. In some situations, higher inflation expectations may not encourage higher spending. In particular, if households are credit constrained, they may care more about the nominal interest rate – the rate they pay to borrow money – than the real rate. In addition, higher inflation may create uncertainty about the future which could cause consumers to revise down their real income expectations and so reduce current consumption (eg Springer (1977)). Lower expected inflation may also increase the real value of cash and other liquid assets and raise real wages if nominal wages are sticky. Bachmann, Berg and Sims (2015) used the Michigan Survey of Consumers and found little impact of inflation expectations on spending. The largest effect occurs when the nominal interest rate was constrained downwards (at the zero lower bound), and in this case higher inflation expectations reduced spending, suggesting a limited role for the real interest rate. How do expectations affect spending at the household level? In the NMG survey results, there is some evidence that households who expect higher inflation over the next twelve months also spend more, and vice versa. 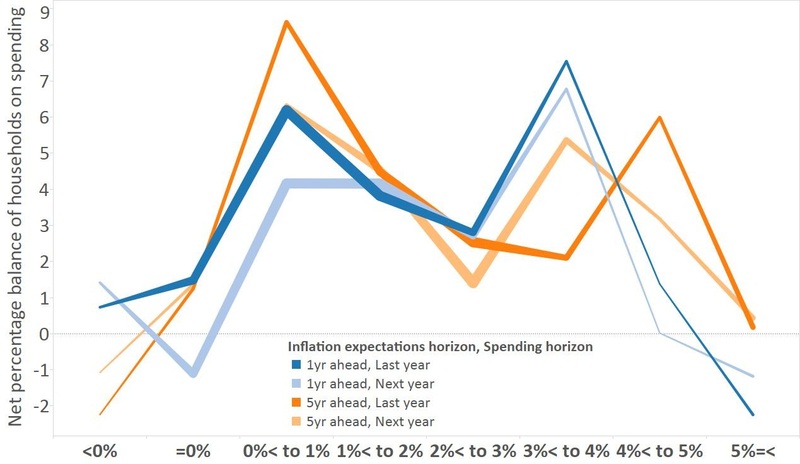 At least for the 80% of households who expected inflation to be below 4% in a year’s time, those households with lower inflation expectations were less likely both to have raised spending over the past year and to plan on increasing spending over the next year (Chart 4). There was much less of a correlation between spending and longer-term inflation expectations, however. Income expectations seem to be important in explaining differences in spending. Households with a positive outlook for income are more likely to have raised spending over the last year and to plan to increase it over the next year (Charts 5 and 6). 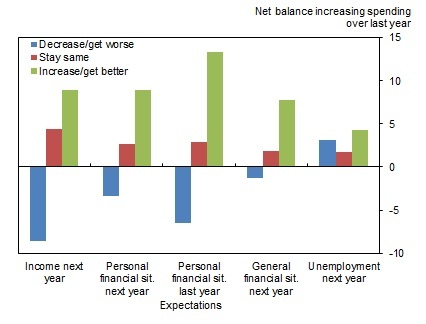 The first positive green bar in Chart 6 shows that among households who expect income to increase next year, more of them expect to increase spending next year than reduce it, ie the net balance is positive. 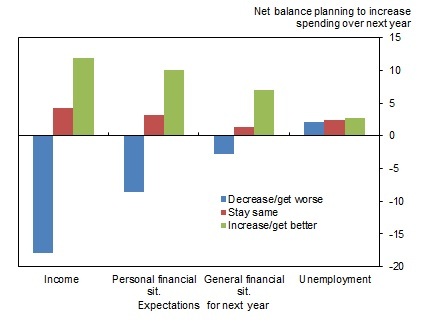 But more households who expect income to fall (the blue bar) expect to reduce spending, so the net balance is negative. The difference between the green and blue bars shows how big the difference in spending intentions is across households with different income expectations. Likewise for other expectations, the difference between the green and blue bars is an indicator of how important that particular expectation is in explaining spending intentions. 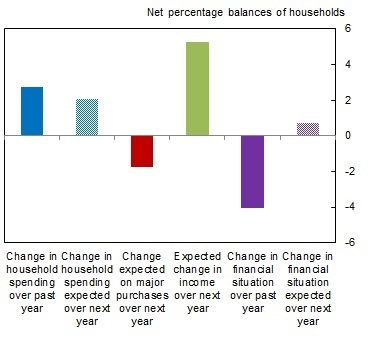 Developments in households’ personal financial situation over the last year also – unsurprisingly – seem important in explaining whether households have changed spending over the past year. In contrast, expectations of the general financial situation and unemployment appear less, or not at all, important for explaining spending patterns, both over the past year and for the next year. So do lower inflation expectations cause households to delay spending? 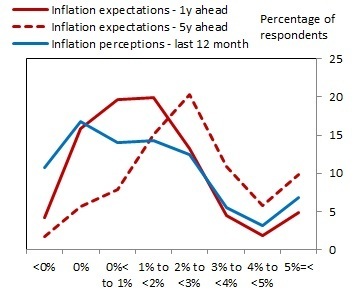 Results from the latest NMG survey suggest that lower short-term inflation expectations may encourage households to hold back spending, although we do not find a role for longer-term inflation expectations. These results are limited by the fact they are only based on one point in time, and the descriptive results shown here don’t account for the fact that different expectations will be correlated within households. Nevertheless, preliminary econometric evidence suggests the main results hold after controlling for a household’s expectations for other variables. Whilst lower expected inflation may help to reduce spending, what actually happens to spending will also depend on lots of other factors, including other types of expectations. There is clear evidence that income expectations are important for spending decisions, and these have been improving recently (Chart 7), which may have acted to offset any impact from lower inflation expectations. We will continue to ask these questions in future surveys to see if the results still hold as the economy continues to recover from the financial crisis, and inflation heads back to the Bank’s 2% target. Philip Bunn, Lizzie Drapper and Alice Pugh work in the Bank’s Structural Economics Analysis Division and Jeremy Rowe works in the Bank’s Monetary Assessment and Strategy Division. Previous Post Are reserves still “special”?